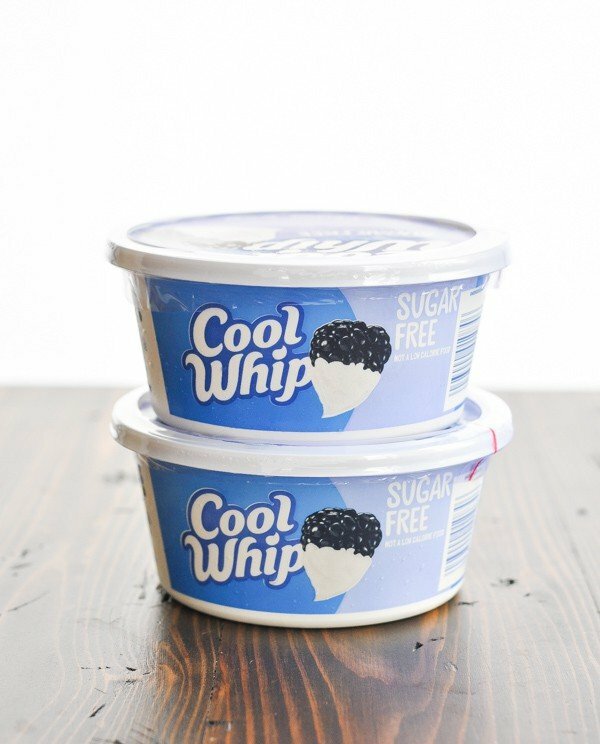 Stir together this sweet and delicious Angel Fluff Cool Whip Fruit Salad in just 5 minutes! It’s the perfect make ahead light dessert or easy side dish recipe for any special occasion. 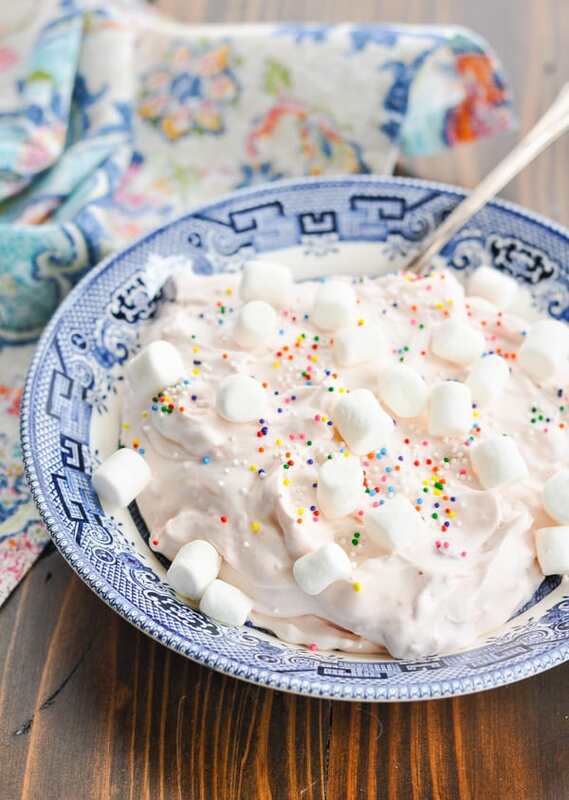 Stir together this sweet and delicious “Angel Fluff” Cool Whip Fruit Salad in just 5 minutes! It’s the perfect make ahead light dessert or easy side dish recipe for any special occasion. Springtime calls for sweet, cool, and simple party-friendly recipes! 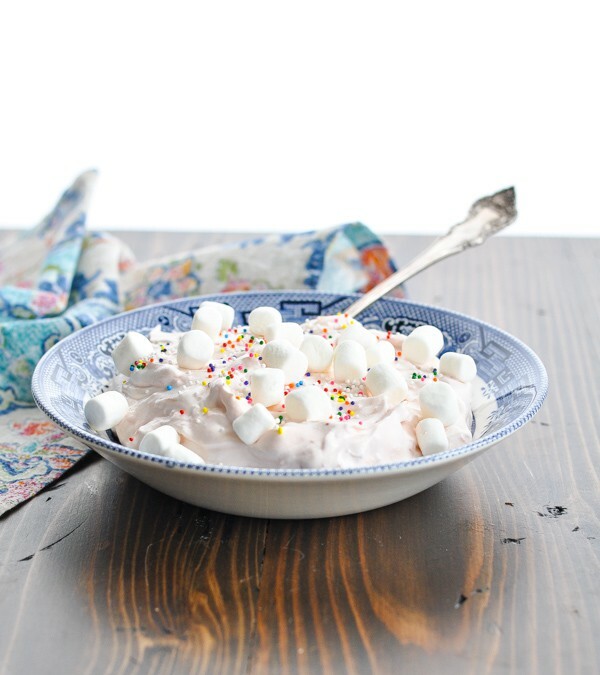 You can toss together this marshmallow fruit salad with whipped cream in just a few minutes, and your friends and family will devour it even faster! While this “salad” is actually more like a dessert, I have certainly been known to serve it alongside a main course. Especially on holidays, a sweet fruit salad seems like the perfect accompaniment to a salty ham or a brunch spread. Gently combine these ingredients in a large bowl. Finally, the Cool Whip! 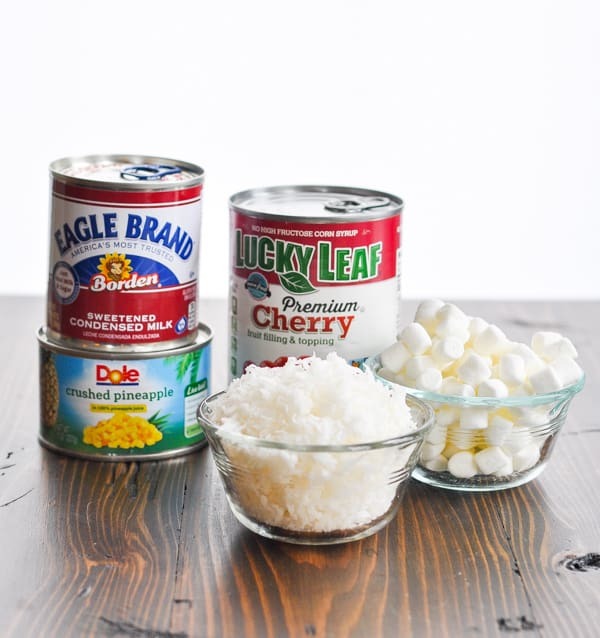 You can use any variety of whipped topping that you prefer. Gently fold the whipped topping into your salad, being careful not to over-mix and deflate the fluffy, airy texture in the Cool Whip. 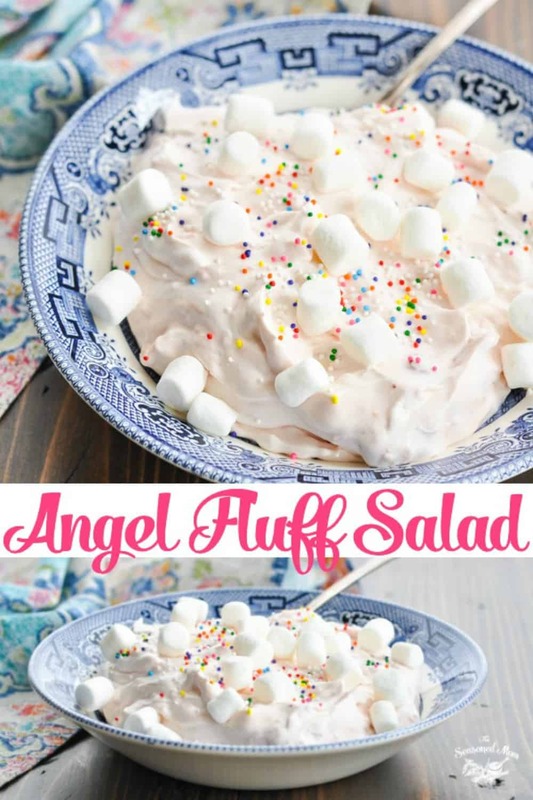 I highly suggest that you garnish this angelic salad with rainbow sprinkles and a handful of extra marshmallows for a touch of whimsy. This is truly the best Cool Whip Fruit Salad! How long will Cool Whip Fruit Salad last? 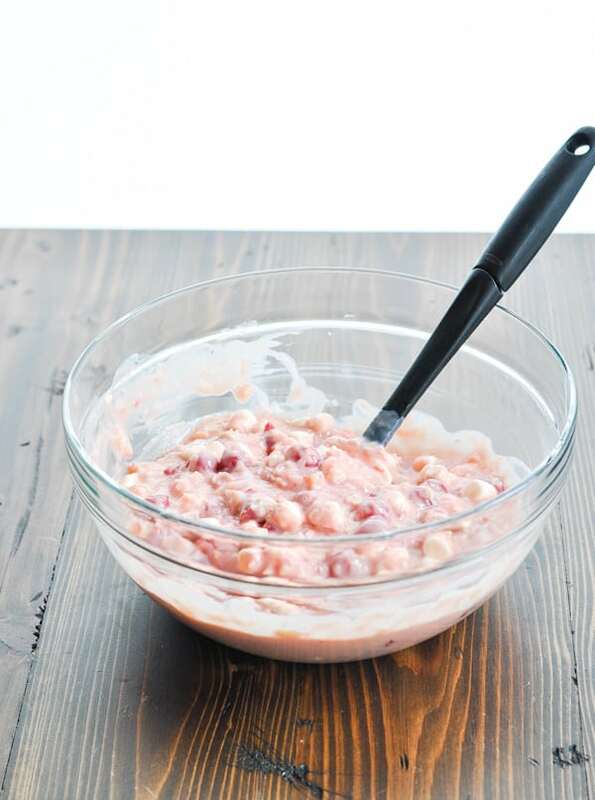 This fruit cream salad does not get watery like other ambrosia salads tend to. As a result, you can make it in advance and it will stay perfectly fresh in your refrigerator for at least 2-3 days. Make sure that you drain the pineapple really well before adding it to your bowl. I like to squeeze out the extra liquid with a dish towel to make sure that the salad isn’t watery. When adding the Cool Whip to the salad, be sure to gently fold it in to the mixture. You want to maintain as much of the airy, fluffy texture as possible. You can prepare this recipe in advance and keep it in the refrigerator for at least 2-3 days. Feel free to add some chopped pecans to this fruit salad as well! 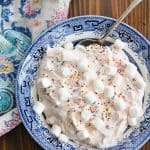 Garnish with additional marshmallows, coconut, or rainbow sprinkles, if desired! Make a Cool Whip Fruit Salad with Mandarin Oranges by substituting a can of the oranges in lieu of the pineapple. 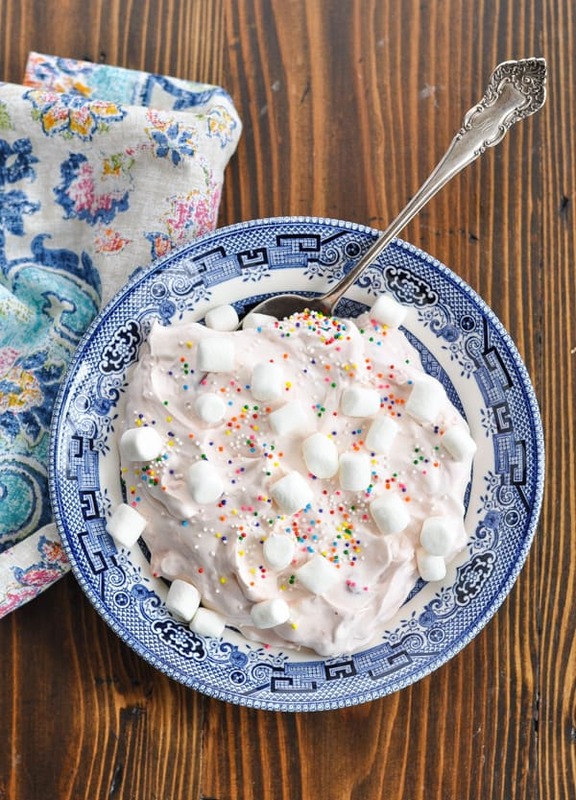 Prepare a Strawberry Cool Whip Fruit Salad by using a can of strawberry pie filling instead of the cherry pie filling. Any variety of Cool Whip or other whipped topping will work. Just make sure that it’s thawed in the refrigerator before you fold it into the salad. Gently fold in the whipped topping until completely combined. 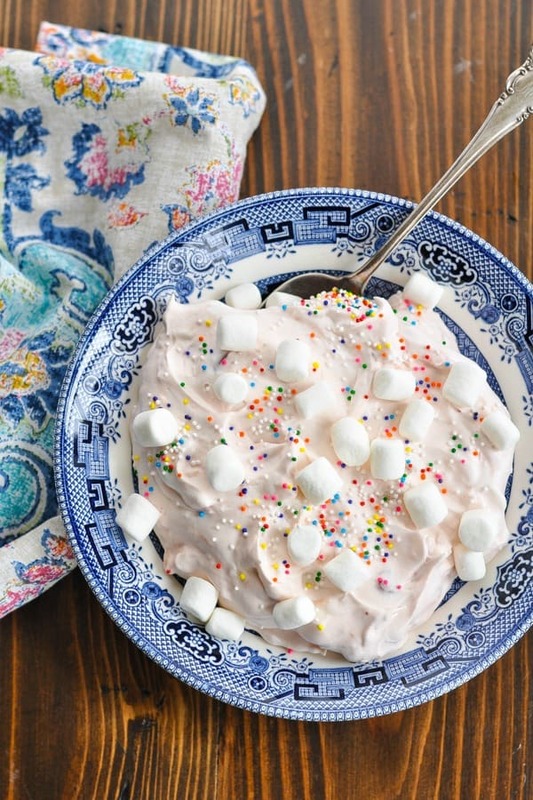 Garnish with additional marshmallows and rainbow sprinkles (optional) before serving. This recipe was originally published in June, 2015. It was updated in April, 2019.